Published in Issue 32 of The Ofi Press. ‘McBurr, two kids have disappeared on their way home from school, I want you to head up the investigation’ ordered DSC Redpath, his voice loud and irritable on the phone. ‘It’s the bairn, she’s currently spitting out apple puree all over me.’ I laughed at Grace and pushed some more pudding into her mouth. She thought that it was a great game, and giggled and spat some more out. ‘I’d prefer it if you headed up the team, that’s if you can make it?’ he sounded a bit less combative. ‘I’ll do it sir, but I’d better ring Barbara to come and pick up the bairn.’ I almost added that she wouldn’t be pleased, I’d insisted on taking Grace out, and then she was due to stay at my place overnight which after six months was a complete breakthrough. I knew that I was cornered. The pathways were streaming with water and rain was lashing down as we left the sports hall and got into the car. The radio said that over three inches of rain had fallen in the last two hours and that there was major disruption though the NE on road, rail and air networks. The traffic was gridlocked, and it took us over twenty minutes to drive there. Storming Norman as desk sergeant buzzed us in. ‘I hadn’t realised that we were recruiting them so young,’ said Norman smiling at the bairn. ‘Norman, this is my daughter Grace, Grace this is Norman, who if you treat him right will make your life a hell of a lot easier.’ I winked. ‘Nasty business with the two lassies,’ said Norman shaking his head. ‘There’s no one drowned in the pools?’ I asked. ‘Aye, I’d heard that there was a meeting of the clans McBurr-Flynn. I’d better get that present out that my Mrs got for the bairn. It’s in my locker.’ He winked at me. The operation room was deserted except for Whizz and Dench. I smiled at both of them, putting the push-chair out of harm’s way. ‘She’s still tiny though. Isn’t she? said Dench. ‘Better than the two pound she was when she was born,’ Whizz replied, coming to the defence of my bairn. ‘Isn’t that Grace’s mam?’ asked Dench, sensing gossip. I nodded my head. Whizz tensed. ‘But I didn’t think you two….’ Judi let her voice trail off but she glanced at Whizz and closed her mouth quickly. Bob Little is a British author based in the north east of England. 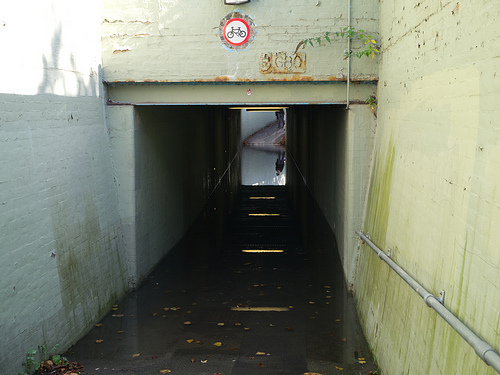 Image: "Flooded Underpass" by Shirokazan.